Dr. Bob Jones III is the chancellor of Bob Jones University in Greenville, S.C. He grew up in a Christian home and trusted Christ as his personal Savior in his early high school years. He was awarded bachelor’s and master’s degrees from BJU. He took additional graduate work at Northwestern University and New York University. Dr. Jones holds honorary doctorates from Pillsbury Baptist Bible College in Owatonna, Minn.; San Francisco Baptist Theological Seminary in California; and Maranatha Baptist Bible College in Watertown, Wisc. He speaks regularly for churches, schools, evangelistic campaigns, youth rallies and other religious gatherings. His speaking engagements have taken him to all parts of the world. He is married to the former Beneth Peters; they have 3 children and 6 grandchildren. A third-generation preacher, Dr. Jones has been influential in Christian education and in the pulpit ministry. He has served in numerous capacities at Bob Jones University, including that of speech teacher, assistant dean of men, assistant to the president and vice president. 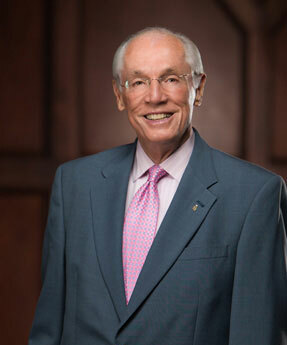 He was appointed president in 1971 and chairman of the Board of Trustees in 1998, the third to hold those offices since the University was founded in 1927 by his late grandfather. He retired as president in May 2005 and became chancellor. Dr. Jones stepped down as chairman in September 2013.